1.1.2.2	Low level functions, get/put byte through serial interface. 1.1.3.3	High level protocol handlers	Path management. 1.1.3.4 Network node functions not requiring message system control - store and forward? 1.2.1	User management - logon, status. Maintain list of current active "users" (ground station in active communication). 1.2.4	Administrative functions - mass store purge, reconfiguration of memory or data links - possibly via control link. 2.3	Ground station hardware control - RF, modem, low level IO. 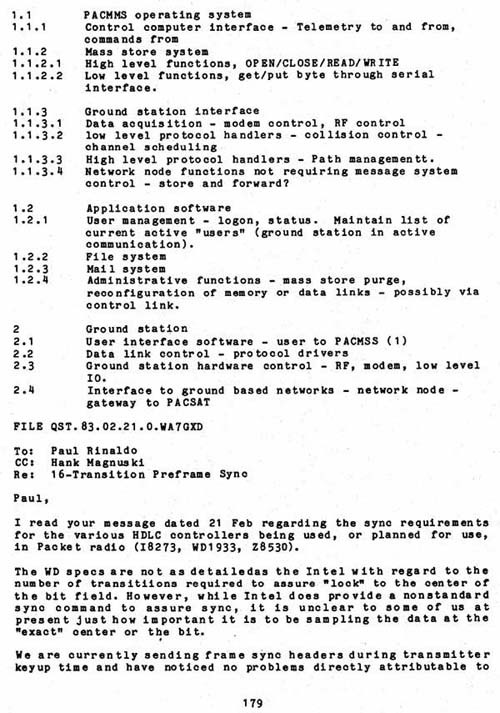 I read your message dated 21 Feb regarding the sync requirements for the various HDLC controllers being used, or planned for use, in Packet radio (18273, WD1933, Z8530). The WD specs are not as detailed as the Intel with regard to the number of transitions required to assure "look" to the center of the bit field. However, while Intel does provide a nonstandard sync command to assure sync, it is unclear to some of us at present just how important it is to be sampling the data at the "exact" center or the bit.